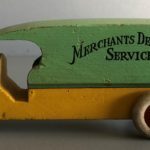 This is a Strombecker Merchants Delivery truck that measures 5″ long. This example has the rarer rubber tires. This truck was produced in the 1930’s.